Cadillac Kolstad impressed the judges with an intense performance. won over the crowd & the judges. This year's judging for the Road To Memphis was held at The Coffee Grounds on Sunday, June 24th and featured three bands and two solo/duo acts. The bands were Nite Rail, The Cadillac Kolstad Band and Armadillo Jump. Cornbread Harris played solo keyboard and the duo of Bill Finke and Pete Meyer rounded out the field of players. All the musicians did a great job making it a difficult task for the judges to select this year's representatives for the IBC in Memphis. It's really too bad we couldn't send them all. In the end the Cadillac Kolstad Band was selected in the band category and Cornbread Harris got the nod in the solo/duo category. Nite Rail opened the festivities led by Mike Fugazzi (vocals & harmonica) with Korey Hicks (guitar), Konr Ness (bass, vocals, keyboards) and James Schneeberg (drums). At one point after strolling through the audience, Mike tossed his harmonica to Korey who used it as a slide for his guitar. The Cadillac Kolstad Band, was next up. The three-piece group is comprised of Andrew "Cadillac" Kolstad on keyboards, Johan Svendson on standup drum and Elmer Johnston on upright bass. The band performed an energetic set with hair flying and sweat dripping. 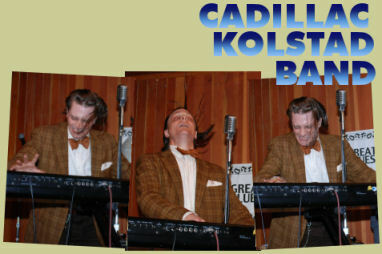 Sporting his trademark bow-tie and plaid sports jacket, "Cadillac" Kolstad led his band through a keyboard driven set focusing on "bluesy" tunes with a touch of "rockabilly" thrown in. Sounds like a perfect combination for a band headed to competition in Memphis. 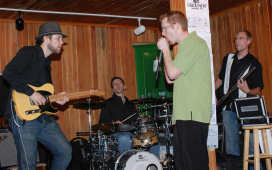 The final group in the band category was Armadillo Jump: a five-piece act consisting of Monica Louise (vocals, guitar), Phil Haire (bass, vocals), John Coburn (guitar, vocals), Andy Kopp (saxophone) and Nick Zwack (drums). As the name suggests, Armadillo Jump played tunes with a Texas blues flavor but they displayed a depth and versatility ranging far beyond that. Monica Louise has a terrific voice and can really belt out the blues. 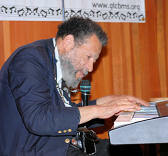 There were two acts entered this year in the solo/duo category: Cornbread Harris on solo keyboard and the duo act of Bill Finke and Pete Meyer. 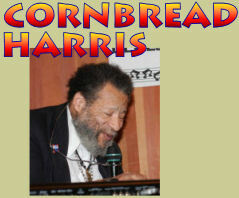 At 80 years of age, James "Cornbread" Harris has been playing the piano for a long time. After he arranged his tattered song book on the music stand, his hands began to fly across the keyboard. Cornbread focused on the blues during this performance although he is well-versed in many different musical genres. It was a treat to see and hear this veteran performer play the blues. After being selected to represent GTCBMS at the IBC, Cornbread mentioned that he had never been to Memphis. It's about time he made that trip. The final act of the day was Pete Meyer (guitar, vocals) and Bill Finke (harmonica, vocals). The duo's set featured country, delta and Piedmont style blues. As the time wound down for their set Bill and Pete cleverly exchanged lyrics, "We gotta go now" and "I wanna stay" blending in a little of Jackson Browne's "Stay" into the mix. The Coffee Grounds owner/sound man, Dave Lawrence, did a great job helping the musicians get set up and hosting the event. 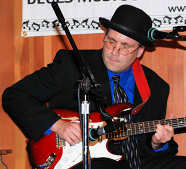 Dave has been a loyal supporter and sponsor of The Greater Twin Cities Blues Music Society for a long time. Judges Nigel, Jym, Nancy, Lynne, & Pat. Volunteer judges this year were Nigel Eccleston, Jym Wroblewski, Nancy Walton, Lynne Bly and Pat Casello. Timekeeping duties were covered by Mary Kay Harcus. Emcee for the day was Gregg Harcus. Doug Spike was the scorekeeper. Jake Jacobson was the photographer. Judy Cedar handled all the other million little details that made the afternoon possible. Congratulations to The Cadillac Kolstad Band and Cornbread Harris and thanks to all the musicians and volunteers who participated in this Road To Memphis event. Be sure to check this web site for information on "Get Out Of Town" fundraising events in the near future to help send our musicians to Memphis in 2008.